Growing orchids is like growing any other kind of plant. There are growers who enjoy them for their beauty and use them as a part of their house decoration. This is much like most people grow poinsettias during the winter months as a decorative accent for the holiday months. After the plant has finished blooming it is disposed of. The next step to becoming a grower is to try to re-bloom that orchid which gave you so much pleasure. Or you try just because the plant is still alive and you can’t bear to throw it away. I suspect that almost all gardeners have tried to re-bloom their poinsettias, mums and azaleas. It’s a natural challenge for anyone who can grow plants. The first thing I’d recommend is to invest in a humidity tray. These are available from a number of different vendors on the web, but they’re hard to find locally unless you have a large orchid supplier close. Check out the selections at 1-888 Orchids, our sweepstakes sponsor, (scroll down to see the humidity trays); Carter and Holmes<; or Quarter Acre Orchids. I recommend the type with a grid above the water tray rather than those that use pebbles. I’ve tried it both ways and have had problems with rot when using the pebble method. Get one of the many good orchid books so that you can learn more about the plants that you’re interested in. Purchasing through The American Orchid Society (AOS) gets you the right books as well as providing a donation to that organization. You will also find AOS Culture Sheets site for many of the most popular genera. Their forum is one of the best on the web with lots of members available to answer questions. 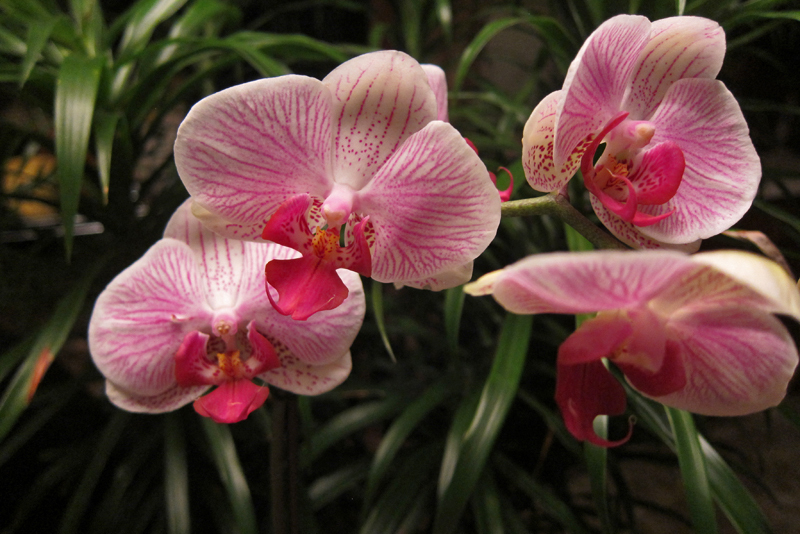 The easiest orchids for the beginning grower are the Phalaenopsis (fayl-eh-NOP-sis) or Moth Orchid and Paphiopedilum (paff-ee-oh-PED-ih-lum) or Slipper Orchid. They are very tolerant of light conditions in a house and with proper handling will re-bloom fairly easily. (See Reflowering Your Phalaenopsis. The main problem for most indoor growers is keeping humidity around the plant so that the leaves do not dry out and the buds do not fail to open (called bud blast). Try a couple of plants and spend some time on one of the many forums learning and asking questions. Visit and join one of the many orchid societies around the world – they are one of the best places to learn to grow orchids in your particular area. Once you feel comfortable, then you can invest in some more plants and try something different.